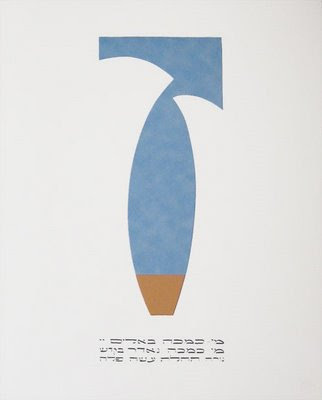 Isaac Brynjegard-Bialik: Nice Jewish Artist: Parting of the Red Sea Papercut:"Mi Chamocha"
I cut this piece as a donation for the 2009 Temple Ahavat Shalom (TAS) luncheon and silent auction, its annual fundraiser (not the ECEC one -- this is the synagogue fundraiser). I got this great idea for totally simplifying the parting of the Red Sea, into this very basic shape -- almost unseen if you're not sure which is the positive and which the negative space. I used two colored papers under the cut to ground it a bit so you can see the sky above the ground the Israelites walked on, under the parted waters around them. The verse is Shemot (Exodus) 15:11: "Who is like You, Adonai, among the gods that are worshipped? Who is like You -- majestic in holiness, awesome in splendor, doing wonders?" Parting of the Red Sea Papercut:"Mi Chamocha"